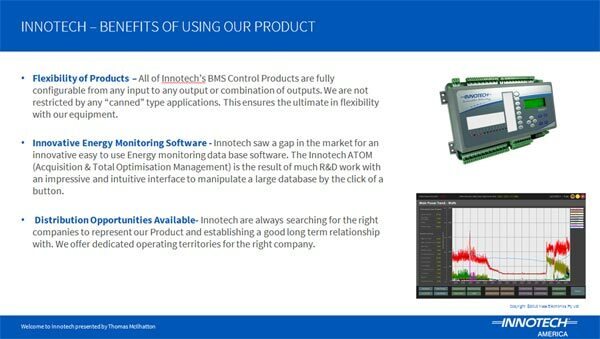 Learn how Innotech Controls can benefit your Building Management and Automation projects and provide your business with new opportunities. Bruce McLennan, Innotech America's Senior Sales Engineer, will be giving an 'Introduction to Innotech Controls' presentation at the 2014 AHR Expo. With representatives from Innotech Control Systems Australia (the manufacturer) and Innotech America (the North American Distibutor) on hand, you will be able to find out all the information you need to start using Innotech control systems on your projects. Innotech's global sales have continued to increase annually, but there are opportunities still available across North America and the globe. Come visit us at AHR New York 2014 and meet the people behind the brand.